NBA Playgrounds’ trailer—indeed, its entire existence—is a throwback to arcade sports games like NBA Jam and NBA Street. The kind of experiences where you don’t even need to be a fan of the sport in question to be able to jump on, learn a few moves and have a good time. Like those classics, there’s the making of a quick, fun sports game here. Unlike them, this game seems to have some fundamental problems. It looks great! The caricatures of NBA stars are (for the most part) spot on, sometimes hilariously so, and if the game made sure it copied one thing from NBA Jam perfectly it’s the spectacle and sensation of a big dunk, presented here with slow-motion camera and explosive effects. Every time you get scored on in NBA Playgrounds, one of your players collects the ball and stands under the basket so they can throw it to their teammate to resume play. 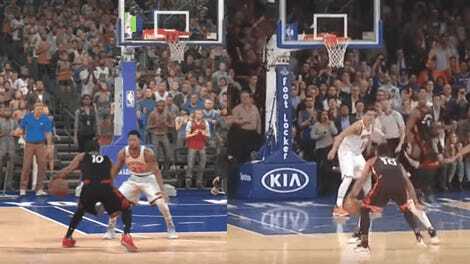 Only instead of being able to quickly inbounds the ball and get going, the game makes you wait until both your opponents are at the other end of the court. For a game taking place on such a small court, and being played at such an otherwise frantic pace, it’s an excruciating slowdown that really harms the flow of the game. 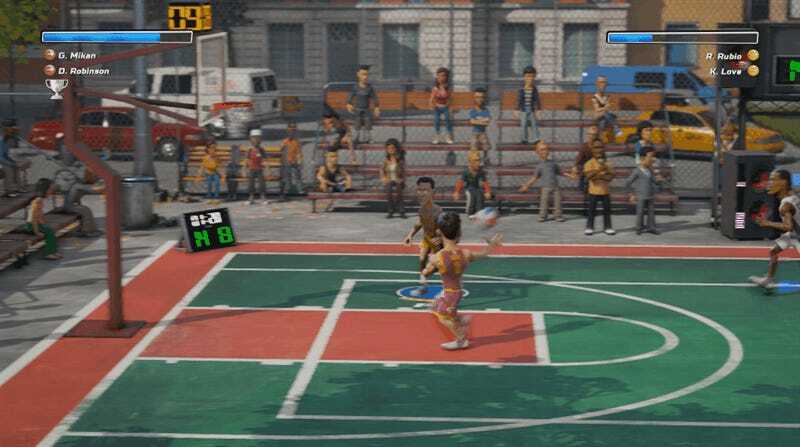 NBA Playgrounds has, like most basketball games, a nuanced shooting system that requires the player to release the ball at a “sweet spot” during their release. Only here it’s never really explained, and the outcomes are overly dramatic. Shots deemed “perfect” by the game earn an extra point, while those too early or late miss. I can understand that being an effective means for sorting out long-range jumpers, but the number of layups and even dunks you miss in this game as a result are a joke. The entire experience feels cheap. This is a $20 title with very limited presentation, poor commentary and basic oversights like the lack of an overlaid scoreboard (there are in-world scoreboards, but they’re a hassle to read in the middle of the action). It also has a limited roster, which you’re forced to expand not just by playing, but by opening packs of random cards. Were this a mobile game, I’d get it, but people buying a game like this on a dedicated home platform deserved something a bit more substantial. On PC, PS4 and Xbox One, how much you’ll be into this depends on how badly you want to play an arcade basketball game with a current roster. 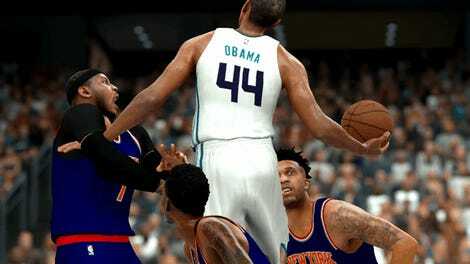 With 2011's NBA Jam: On Fire edition still available on digital stores, EA’s game is still clearly the better casual sports experience, even with an outdated crop of players. NBA Playgrounds is also available on Switch, though, and playable using a single Joy-Con, so if you’re done with Zelda and are looking for something a bit more social, this might be an easier sell on Nintendo’s system.